Supreme Integrated Technology, Inc. (SIT) was an integral partner for the liquefied natural gas (LNG) regasification system that supplies fuel for the vessels El Coquí and its sister ship Taino. The LNG Pump Room is designed to contain and process LNG for supply to a 722 ft. (220 m.) long ConRo vessel with capacity of 2,400 twenty-foot equivalent (TEU) and space for 400 vehicles. The pump room is constructed of 316L stainless steel and is built to handle the impact of cryogenic leaks of the LNG. 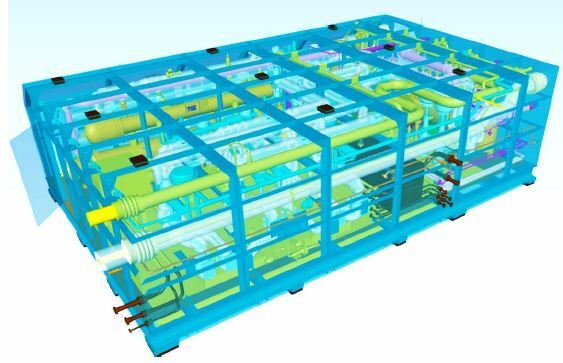 The Room is a Zone 1 Gas Tight Compartment and certified by US Coast Guard and DNV-GL as a Secondary Barrier. What is the purpose of the LNG pump room? The LNG pump room aboard the vessel extracts the liquefied natural gas from the storage tanks and runs it through a regasification process of vaporization, pressurization, and heating. The gaseous natural gas is then routed from the pump room into the engines to convert into mechanical energy and propulsion. What was SIT’s scope of supply for this project? Designed, fabricated, and tested the structural housing for the LNG pump room to withstand leakage and expansion of LNG. Developed custom, DNV-approved testing procedures. Fabricated, installed, and tested the hydraulic, water glycol, and LNG piping systems internal to the LNG pump room. Installed various valves and machinery items as part of the regasification system inside the LNG pump room. SIT is proud to have been such a vital part of the LNG Pump Room project. More info on the first two LNG fueled Jones Act ConRo ships may be found in this MarineLog article.